Have a hard time finding good work pants in my small rural community. These are perfect. I do have to hem them however - short legs. But the color is true and deep. Love them! 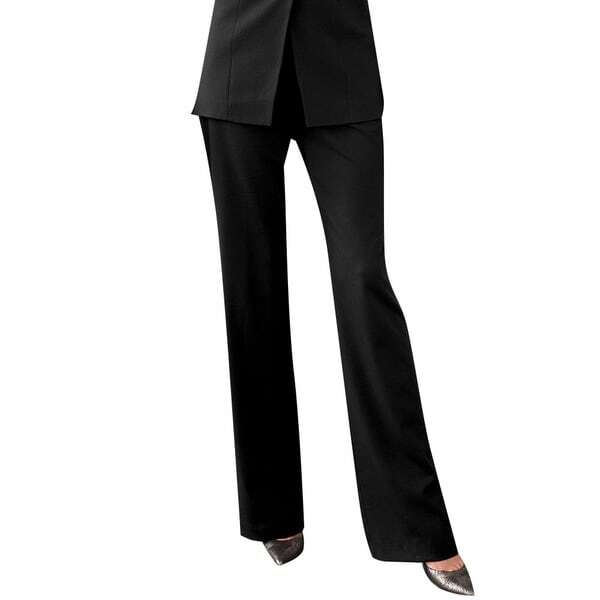 Pair these comfortable flat-front pants by Affinity Apparel with a trendy blouse or sweater before heading to work. These rayon-blend pants contain spandex to ensure a comfortable fit and are machine-washable for easy cleaning. Be prepared to hem your pants and they seem to run over a size larger than average pants. comfort and exactly the right material. these pants were really nice however they were too long. I am 5'9 and the pants were too long. If I was 6'2 they have had fit ok! I returned them. These pants are very comfortable, but be prepared to get them hemmed. They are incredibly long. My only complaint aside from the length, is that they are already piling. One Star at most!!! Very cheap looking!!!!! Amazingly comfortable and looks great! Love this brand and is great with a blazer. The black really stands out and looks professional. Would recommend to anyone. Comfortable to wear all day in a professional setting or conservative event. "When will you get more sizes in slate?" We do not know if more slate pants will be restocked.